We want our children to become lovers of great books. We know we need a plan, but where do we start? I commend to you the following resources. Every home should own a copy of these books. Buy them for baby presents. Give them as Christmas and birthday gifts. Their pages are full of inspiration, exhaustive book lists, and helpful suggestions for creating a family culture that is rich with reading. This is a list of books… about books. Enjoy. This book was my initial invitation to the banquet of beautiful children’s books. It gives a thoughtful and compelling case for why we need to read books, good books, in our homes. 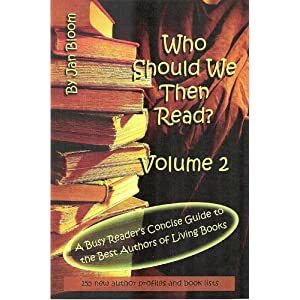 After educating as to the “why” regarding reading, the book gives an extensive age-appropriate list of “what” to read. Last summer, in order to keep pace with my boys’ voracious reading appetites, I made a long list of great books from which they could choose to read at their own pace and for their own pleasure. It was Sarah’s book from which such a list was born. To say that Sarah grew up in a book-appreciating home is like saying that a student at Juilliard takes piano lessons. 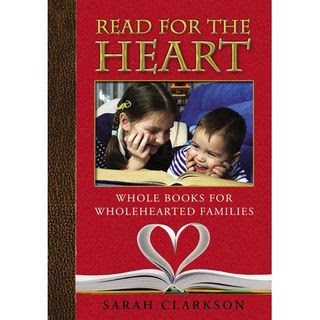 Sarah’s home was a rich environment in which her love for good books was organically grown, and Read for the Heart is an overflow of her personal experience. Its heart, content, and format make this book a pleasure to navigate. You can purchase Sarah’s book here. This is a classic “book about books” that is a staple in our home library. It does an excellent job of categorizing books by over 2 dozen subject areas as well as by age group. With tears in my eyes, I can tell you that my children’s childhoods, and yes our family, was changed forever because of Jan Bloom. We were fortunate enough to befriend her several years ago, and I have yet to meet someone who knows more about children’s literature. This is a one-of-a-kind reference tool that covers hundreds of authors, their history, and a complete listing of each author’s works. It also contains lists of great books for boys and lists of several series. Jan and her husband, Gary, travel across the country with over 4,000 out of print and vintage books. In addition to being booksellers, they speak at conferences educating families about how to create a quality home library. You can buy Jan’s books here. 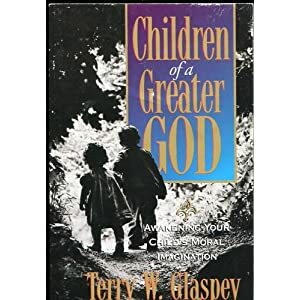 This book is out of print, but worth the work to find it. Glaspey’s approach (and I’d suggest to life in general) is refreshing and inspirational. In the book’s introduction, he states, “An old-fashioned phrase aptly describes the goal of this book: training the sensibilities. By this I mean the training of your child’s thoughts and feelings. By introducing your child to what is truly good, whether it comes in the form of moral character or great art or music, you further the process of training him to be a person whose heart will deeply resonate with the good.” Rather than parenting (and living) out of fear, we should fill our lives with that which is truly beautiful, and our children will learn to recognize and be drawn to it. I believe that the same principles apply equally to adults. A fairly good book list is embedded in the middle of the book as well as in the appendix. The more we learn about truly great literature which is of moral value, the more discriminating we become in choosing books for our family. Lamplighter Publishing has served us all well by finding excellent (often out-of-print) literature, then reprinting the books in beautiful cloth-bound covers. Their online catalog is extensive, yet is organized in such a way that you’ll feel like you’re strolling through the aisles of a meticulously cared for old bookstore. You can buy individual books as well as discounted collections. If you’re not sure where to start, I’d recommend Teddy’s Button, which is just as relevant for adults as it is for children. I’ve never experienced such a simple, yet poignant description of the internal battle between good and evil which is ongoing in all of us. These books are worthy to pass down for generations, and they make excellent gifts. I should note that all of the books mentioned above contain extensive reading lists which are as relevant to adults as they are to children. Don’t let the pictures on the covers deceive you… you can find a plethora of great literature in these pages from which to make your own reading lists for the next several years! Just in time for summer reading, we’ll take the next two Fridays to focus on the much-neglected subject of books for boys. Plan on joining us. We’ll look forward to seeing you! I second The Read-Aloud Handbook. It’s a great resource that touches on all sorts of genres, not just the educational ones that instructors love. Loren – I’m so glad you’ve enjoyed it. Yes, that’s what I’ve appreciated about all of these books – their book lists are rich and diverse. Their timelessness and quality really do make the books as good for the adults as they are for the kiddos! “Honey for a Child’s Heart” helped shape my thinking about the importance of reading aloud to my children. The rich blessings of those shared hours, in turn, shaped much of who we are as a family now my children are grown. It is a wonderful guide. Another out of print guide to children’s books I found helpful when my children were young is “Books that Build Character: A Guide to Teaching your Child Moral Values through Stories” by William Kilpatrick and Gregory and Suzanne Wolfe. The commentary on each book recommended is excellent. I look forward to what you have to say about books for boys – adventure, heroes with integrity are vital, but the one thing I find frequently missing on lists is humour – I know that much of what passes as humour in young children’s books of today is merely vulgar, but after many years spent tutoring in early literacy skills, I know most young boys delight in what I think of as ‘clever ridiculous’ – I hope you have a few of those on your list. Judy – Me as well. 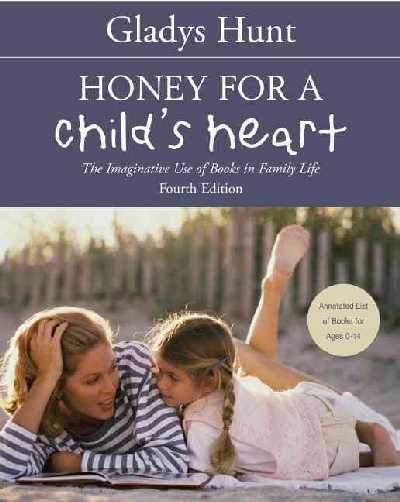 “Honey for a Child’s Heart” was my introduction to reading as a substantial part of family culture. I’m so, so grateful. And yes, I’m looking forward to sharing thoughts on (and books lists for) books for boys – and hearing your feedback as well! Kimberlee – Indeed, the Glaspey book and Lamplighter are lesser-known treasures. Please report back! I also feel inspired to create playlists of the classical music he recommends and learn more about art, two areas of my own education that were sorely lacking. Thanks to Glaspey (and you, for recommending him), I want to remedy that! One of these days, I’ll post some great resources to use for art and music. In the interim, try the Opal Wheeler series on the childhood of famous musicians (they are amazing) and Hillyer’s “A Child’s History of Art” – both great places to start. My mom still has her copy of Honey for a Child’s Heart that literally traveled the world with us. I remember browsing it myself as a kid, and I know it influenced her a lot in what she read to us. Now it looks like it’s my turn to spread the wealth to my kids! Children and Books by May Hill Arbuthnot was my textbook in college for our Teaching Reading course. I referred to it regularly while raising our 4 girls, have loaned it out to various friends and still refer to it often even though our girls are all married and have children of their own. It is one of my most treasured books! She has book suggestions for all ages and even a great section on the importance of reading as a family. The books are divided by categories such as biography, religious; fairy tales, myths, & epics; stories from other times; stories from other places, several sections on poetry, and also talkes a lot about illustrators. There are many pictures in the book of the books and illustrations she talks about. I consider this book a must have for any home that places an emphasis on reading. I also recommend to people that they go online to find the lists of Caldecott and Newberry award winners and runners-up, then look especially for the older ones. When you find a favorite author or illustrator, look for every book you can find by that author/illustrator, and you will not likely be disappointed.